Katrin Ultima Hand towels are a thick, highly absorbant hand towel that are gentle on your hands whist maintaining high standards of hygiene due to the unique dispensing system. 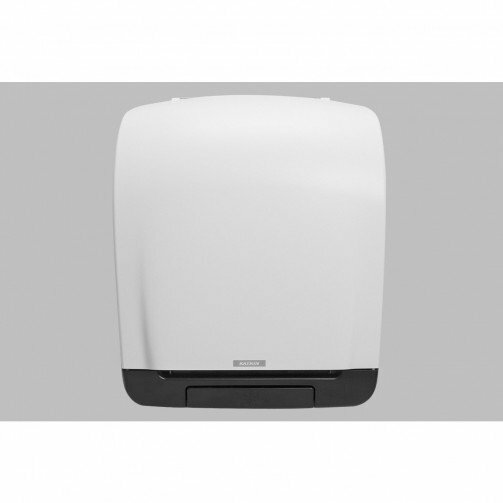 This Katrin Automatic Towel Dispenser features a duplex locking system allowing a choice of keyed or keyless operations which feeds the next sheet/hand towel automatically. Therefore the next sheet/hand towel produced should always be clean and untouched this also ensure that all the paper on the roll is used. This dispenser is highly functional with many smart features, such as the easy refill system, controlled consumption and it is also a very reliable unit. The high capacity rolls it takes have 800 sheets per roll which is enough to dry hands anything between 400-530 times, this makes it an ideal hand towel dispenser to use in high traffic washroom areas such as school, bars, hospitals, etc.